The Carleton lab has begun to use ChR2 to stimulate neurons, and we want to use the most realistic stimuli possible. One of the areas we want to stimulate fires at ~100Hz when active, but in researching ChR2's properties, I found that it can't drive neurons past 30-40Hz, for a couple reasons. 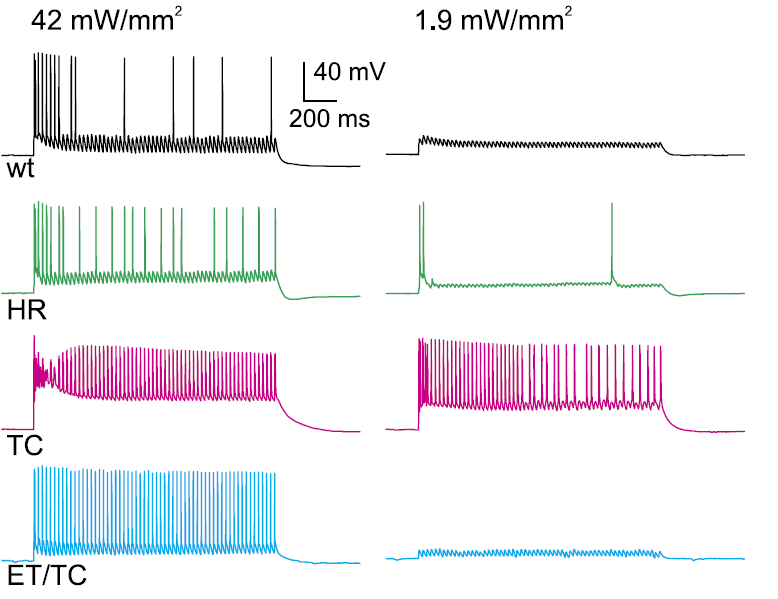 First, and most importantly, the channel kinetics are too slow: it takes 1-2 ms to open, and has a toff of 8ms, which in a perfect world might be ok, but in practice is insufficient. Second, the conductance of the channels is modest, which makes it harder to drive firing. Various labs have been sifting through ChR2 mutants to find versions with different absorption spectra, and channel properties, so I did a Google Scholar search, and found a new variant from Thomas Oertner's lab (I met him once at Wood's Hole; great guy). In their paper, they report a new point mutation, T159C (TC). ChR2's photosensitivity comes from a conformational change to bound retinal, and the T159 residue lies on the surface of the retinal binding pocket of ChR2. To test this mutant, they transfected Xenopus oocytes and neurons with it, and found that that the mutant increased the conductance of ChR2. The downside was that it had slow kinetics, and stayed open too long, leading to prolonged depolarizations, and inactivating voltage dependent Na channels (see pink trace in figure below). To compensate for this, they added a second, known point mutation E123T (ET), which quickens both the activation and inactivation kinetics of ChR2. The ChR2 channels with the combination of these mutations were able to induce action potentials at high frequencies (100Hz in interneurons, ~40-60Hz in pyramidal cells), while not significantly changing the resting membrane potential (blue trace in figure below). Voltage traces from neurons during blue light stimulation at 40Hz. TC has a high steady current at 42 mW/mm2, while ET/TC can follow the stimulus. At lower intensities, TC is able to follow the stimulation with ET/TC is not. From Berndt et al 2011. Reading these papers made me think: 1.) I don't know nearly enough about ChR2; and 2.) We all remember the breakthrough technologies, but we rarely appreciate the incremental advances that make new technologies widely practical. A good example is the discovery and development of GFP. GFP was probably the biggest technical advance of the past twenty years, but it took decades of work to become useful. In brief, it was discovered almost fifty years ago by Osamu Shimomura as the protein responsible for bioluminescence in jellyfish. Then twenty-five years later Douglas Prasher isolated the protein sequence for GFP and Richard Chalfie expressed it in E. coli Even then, though, GFP wasn't ready for primetime, and Roger Tsien and others spent years modifying GFP -- increasing its stability, shifting its spectrum, increasing (or decreasing) its excitation cross-section. The end result EGFP, is now the standard by which all other fluorophores are measured, and useful in wide applications. Channelrhodopsin is still probably at the red fluorescent protein stage of development, where it's usable, but imperfect. The EC/TC ChR2 variant described above extremely new, having been published online at the beginning of April. From my naive view, it looks like the new standard for ChR2. We'll see how long it takes someone to improve upon it. Berndt a, Schoenenberger P, Mattis J, et al. 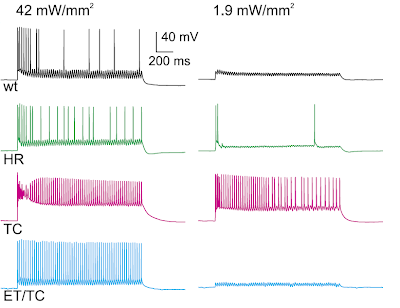 High-efficiency channelrhodopsins for fast neuronal stimulation at low light levels. Proceedings of the National Academy of Sciences. 2011;2:10-15. Gunaydin L a, Yizhar O, Berndt A, et al. Ultrafast optogenetic control. Nature neuroscience. 2010;13(3):387-92.